Chicago is celebrating the 100th Anniversary of Daniel Burnham's Plan of Chicago. 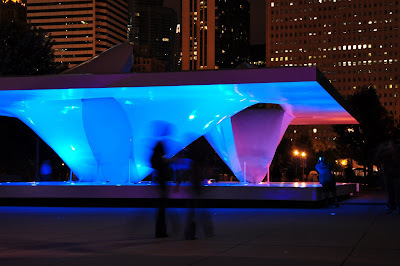 They have erected a Burnham Pavilion that, at night, is interactive in that the colors change in response to activity (usually, kids running around the pavilion). During the day, you can wander through the pavilion and get different frames of the Chicago skyline surrounding Millenium Park. I learned on Wednesday, while watching a new documentary about Daniel Burnham, that today (September 4) was his birthday. I also learned that his architectural and urban design expertise spread beyond Chicago, touching Cleveland, San Francisco, Washington DC, and Manila. He had a very strong interest in cities by lakes/oceans due to his childhood home being near a lake. He alwasy wanted people to be able to look out over the water. We were over at the park last night for the Benny Goodman concert. It was such a lovely evening. great photos, love the night shot! !--happy birthday daniel burnham! Wow! Besides your photography being fantastic, I just started reading the book tonight about Daniel Burnham: "The Devil in the White City" by Erik Larson. Oh wow, that is awesome. Gotta check it out!